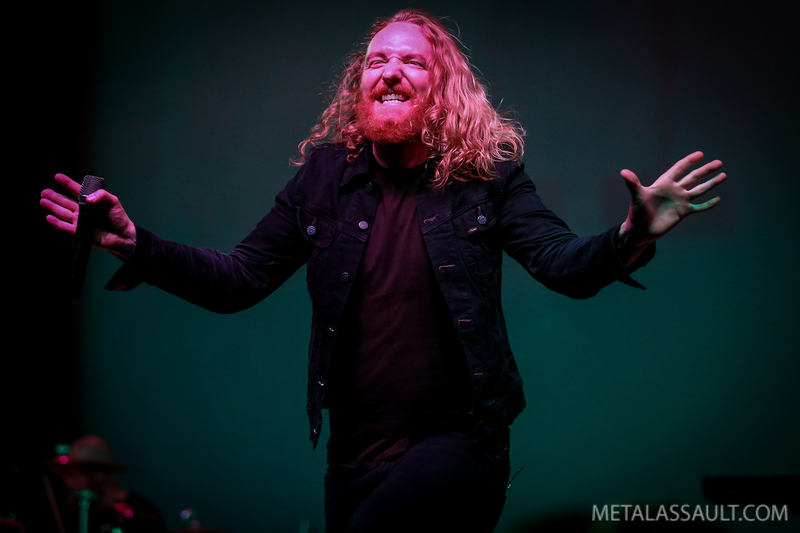 November 30th 2016, City National Grove Of Anaheim, Anaheim CA: Swedish melodic death metal veterans Dark Tranquillity unveiled their eleventh full-length studio album ‘Atoma’ in November 2016, and to coincide with the release, set out on a North American headline tour the same month with support acts Swallow The Sun, Enforcer and Starkill. Heading into its final week, the tour arrived in Southern California for two shows, the first of which took place at the City National Grove of Anaheim on a chilly Wednesday night. By most of the participating musicians’ own admission, the venue was far too big for this tour package and stood out as quite the anamoly on an itinerary that took the four bands to much smaller venues all over the country, but metal diehards from Los Angeles, Orange County and surrounding areas turned up to attend a show they hoped would make the trip worthwhile. Doors opened at 7, the crowd slowly trickled in, and by 8 PM, all was in readiness for the first band Starkill to start the evening. 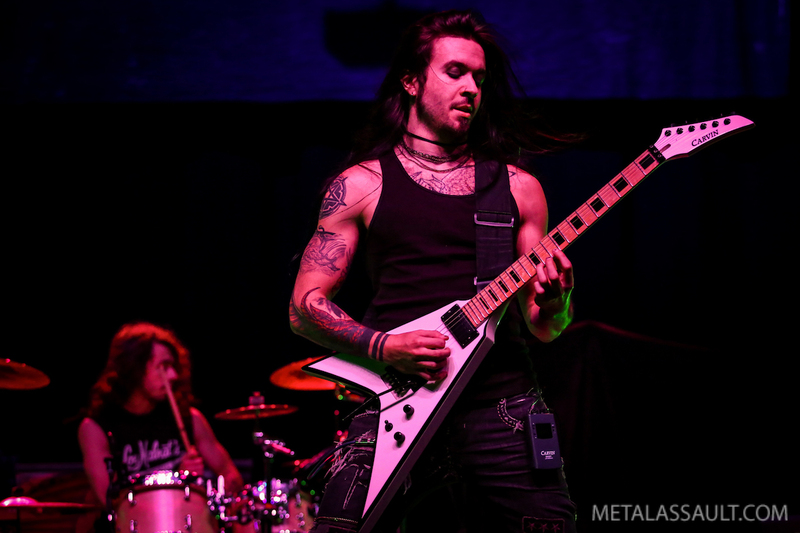 The quartet from Chicago played a solid 30-minute set of melodic/symphonic death metal, presenting a combination of clean and harsh vocals with sweeping guitar licks. 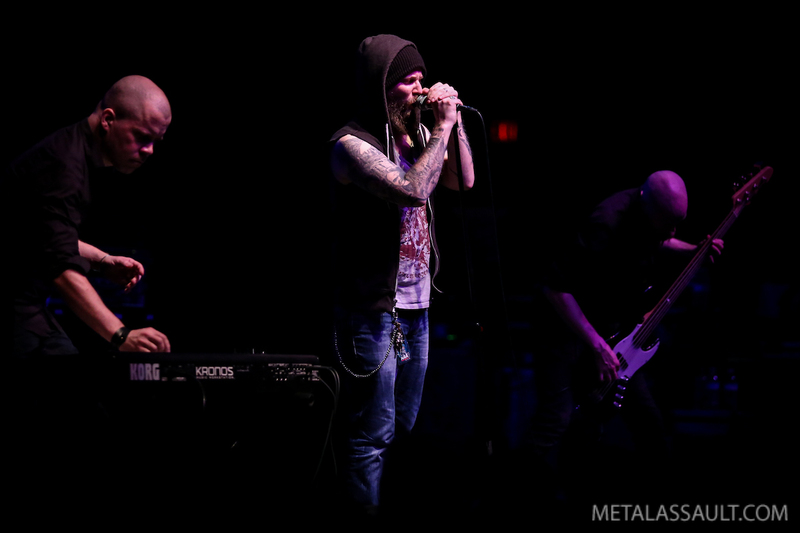 As they did on their recent tour with Ne Obliviscaris, Starkill brought good energy to this stage and served as an apt opener for this lineup, as they were musically very much up the alley for Dark Tranquillity fans. Next up was Swedish group Enforcer who also played a mere 30 minutes, but their performance turned out to be all-conquering in the context of this evening, as they broke necks and crushed skulls with their scorching exhibition of unabated heavy metal, a 7-song set overflowing with unmatchable energy, intensity and musicianship. Starting with three songs off of their 2015 full-length ‘From Beyond’ and then delving into selections from the ‘Death By Fire’ and ‘Diamonds’ albums, Enforcer utilized their allotted stage time to the maximum by picking their strongest, catchiest, fastest songs to not only please the section of their fan base that had traveled from near and far, but to leave first-timers stunned and amazed at what they were witnessing. This is the kind of band that instills pure excitement like no other, even amongst the most skeptical and jaded critics and naysayers of modern-day metal bands. Leaving the two remaining bands no chance whatsoever to be any kind of match to their triumphant efforts on this stage, Enforcer emerged as the best band of this show by a huge margin. Swallow The Sun had the unenviable task of following the Enforcer set, and turned out to be the exact polar opposite of everything Enforcer did, with their style of extremely slow-paced and mellow death/doom, and their completely stationary stage positioning. Swallow The Sun is an excellent band in their genre, have been existence for more than 15 years and rightly have garnered a fan-base for themselves through their six studio albums and corresponding tours, but this was not their night, and it was humanly impossible to be able to appreciate their performance after the kind of show the band before them put on. Great band, wrong tour. And finally at 10:40, it was time for headliners Dark Tranquillity, as the approximately 200-strong audience happily greeted their arrival. This is not a band that tours the States every year, but when they do travel to these shores they make it worthwhile for themselves as well as fans, typically playing extensive sets with long encores. This was no different in that regard as they delivered a 19-song set which included as many as five from the’Atoma’ album, blended in with songs from the back catalog. There were several selections from ‘Construct’ (2013) and ‘Damage Done’ (2002), and some from ‘Fiction’ (2007), ‘Character’ (2005), and ‘Haven’ (2000). With the song ‘ThereIn’, the ’99 album ‘Projector’ is far back as Dark Tranquillity went in this set, in terms of revisiting their history. 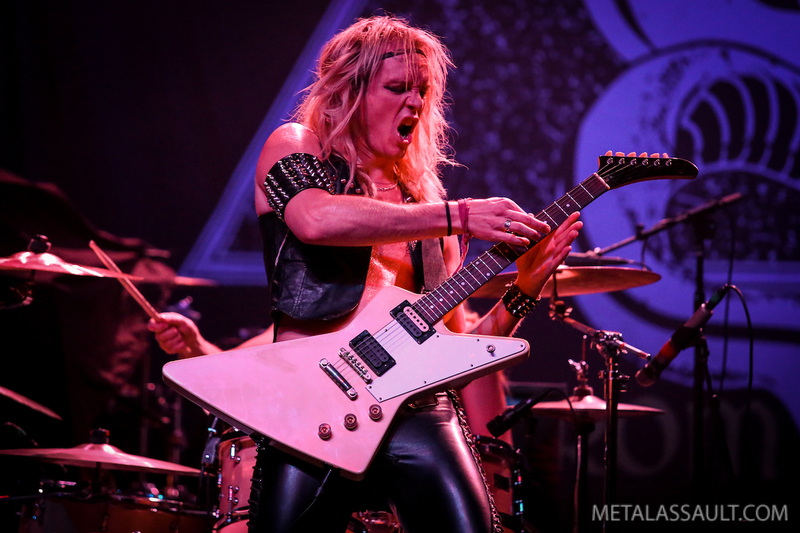 Mikael Stanne still is one of the finest frontmen in metal, one who smiles more than others but puts forth both the growling and clean vocals admirably, and has mastered the art of stage banter, knowing what, when and how much to talk between songs. Many people in the crowd were constantly yelling out song titles, probably more than any crowd has done at a show in recent times, often draining out Stanne’s talking voice, but his attitude towards them was exemplary and he handled it with utter professionalism. The songs were performed to perfection by Stanne and his band mates, and they showed why they’ve still considered as one of the true pioneers of Gothenburg melodic death metal. 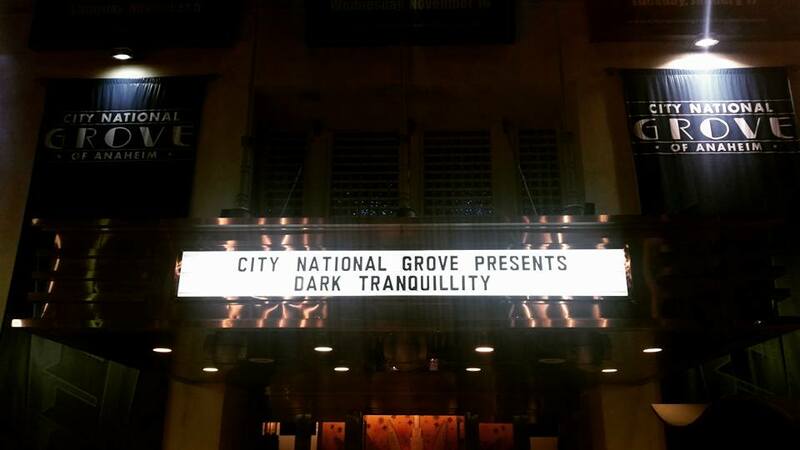 The projection screen in the stage backdrop came across as a new and welcome addition to the live Dark Tranquillity experience as it allowed the band to use visual projections to accompany the music, but the display of lyrics in giant words was a bit tacky and unnecessary, specially with the kind of music they’re playing and the audience demographic they cater to. Other than that, the band hardly put a foot wrong and succeeded in delivering a show well worth the fans’ investment of time and money. Overall, an entertaining outing to see an intriguing lineup of bands, of which the second opener dominated the rest but the headliner did not disappoint either.